While dogs may enjoy playing with a flying disk in the park, swimming in the lake and other summer fun, most cats get less attention. School is out; families spend more time together in the backyard or on vacation. That usually means less time with their cats and indoor only cats being creatures of habit, miss their humans and their usual routine. 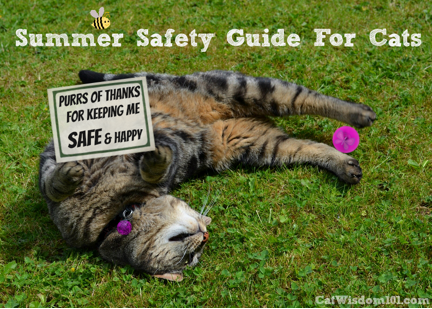 Let’s make this summer safe and happy for your cats. Allow NO unneutered/unspayed cat outdoors. Be sure they wear ID and are microchipped. Keep cats indoors at night even if you have a safe, fenced in yard. 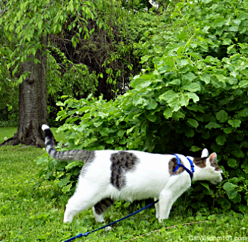 Summer is great time to teach a cat to walk on leash. Consider doing agility training in the backyard. Leave fresh bowls of water outside in shady spot. Behavioral issues are more likely to crop up when routines are changed. Anxiety, separation anxiety and varieties of aggression can result. More animals roam in the summer from neighborhood pets to wildlife. This is the most likely time for incidents of direct aggression and redirected aggression to occur. When an indoor cat is agitated by an inaccessible outdoor animal, they may lash out to the nearest person or pet (redirected aggression). Run-ins with other animals can result in a variety of skirmishes from playful to deadly. An unspayed or unneutered cat is guaranteed to increase the kitten population when shelters are bursting at the seams during summer. A small claw swipe can easily turn into a hidden abscess. All the more reason for more frequent pet exams. During normal petting or play sessions take the opportunity to observe anything amiss i.e. sore spots, itchy areas, hair loss to excess grooming or limping. Most cats blanch at the sight of a suitcase. They know someone is going away. When making vacation travel plans, plan well in advance for cat care. Most dogs love a good kennel or doggie hotel but cats aren’t pack animals and would rather stay at home. Professional pet sitters are an excellent but pricey option. I recommend visits of at least 2 per day. If opting for a neighbor or friend to cat sit have a clear understanding of what is expected with written instructions. Be creative. Perhaps there is a family member or friend who likes cats, would like a change of scene and happily move in for a week or three. Connect with other cat lovers locally i.e. via MeetUp.com groups to exchange cat sitting services. For cat lovers who weekend at their beach or country home, they must decide which option is best: bringing the cat or providing at home cat care. No, it’s not okay to leave your cat alone for the weekend. Anything can happen. I’ve known cats who happily travel by car every weekend to their second home but most do not. If you are leaving for any period of time communicate to your cat that you are going away for X amount of time, someone will take care of them, you will return and you love them. If you are taking kitty with you on a car trip: a safe, well-ventilated and secured carrier, travel size litter box, scoop and litter in plastic container (I like recycling quart-size yogurt containers), plastic bags, paper towels, moist towelettes, familiar smelling cat bed or pillow, brush, water, food, treats and any meds or supplements in small plastic travel containers. I like to spray calming pheromone products like Feliway or Comfort Zone in the car and add a plugin version of the pheromone product at the destination. Never leave a cat unattended in a car even with the windows open. The temperature in a vehicle even with the windows open on a hot day can rise to 120 F in a few minutes. Cats are lovers of heat but on hot days, a cat’s temperature can quickly surge past the normal 100.5 – 102.5 F to heatstroke.Watch for signs of heat stroke: open mouthed panting, thick saliva, bright red tongue, rapid heartbeat and lethargy. If your cat seems over-heated bring her to a cool area, let her have access to a cold floor or surface to lie on and even applying a fan if symptoms persist, call a veterinarian. Young kittens, senior, or sick cats are more prone to becoming dehydrated and at risk for heatstroke. If there is a severe heat weather advisory, this extends to our pets. Use common sense. When leaving home for work or any extended period, make sure to leave the A/C on or open windows and turn on ceiling and other fans. For floor or table models of fans, check the cords for signs of being chewed. Some cats don’t like a fan or A/C blasting near where they sleep. Adjust their bed accordingly. Provide plenty of fresh water daily in numerous locations. Add ice cubes as a treat. They’re fun to play with. Water fountains are popular and keep all bowls clean to avoid bacteria. If hand washing, wash and rinse until squeaky clean. Keep toilet bowl lids down and watch outdoor water sources that may be contaminated. Consider buying a gel cooling mat. 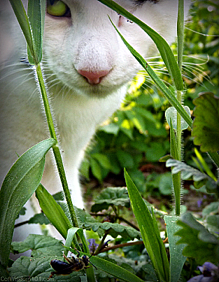 Cats can get sunburn and skin cancer especially one with pink ears and noses. Keep cats indoors during peak UV times between 10AM to 2PM. Remember heat rises. Inspect all your cat’s favorite places to play, hide and nap. Perhaps a tall kitty condo or scratching post can be relocated to a cooler spot. All cats love window whiffies, the chance to smell the pleasures of fresh air. With warm weather and open windows, check all screens and window sashes including sliding glass doors are secure and in good repair. Cats have no fear of heights and will walk on the narrowest ledge, balcony railing or fence. Cats falling out windows is so common it has its own name: highrise syndrome. Creating a safe outdoor space with a catio can be a wonderful summer project for the whole family. They range from small units that fit outside a window to room size enclosures attached to the home. A screened in porch is another alternative. Porches, decks, balconies and gardens are places of relaxation but can harbor unsuspecting dangers from citronella candles, insect repellent especially with DEET, sunscreen, weed control, pesticides, ant and slug bait. Store anything toxic or unsafe away from curious kitties. That includes coolers of drinks or food like raw chicken for a BBQ. Summer is bug season. Insects, fleas, ticks, scabies, mites, mosquitoes, bee stings, spider bites oh my! Even indoor-only cats are at risk. Tapeworms can occur from ingesting fleas. Mosquitoes can carry the West Nile Virus (WNV). While ticks are unpleasant for cats, the good news is it’s very rare for cats to contract Lyme disease from ticks. Preventative flea/tick treatment is the best bet. There are many choices from the topical chemicals to natural oils and diatomaceous earth. A quick daily brush with a flea comb is an easy way to stay on top of flea/tick issues. 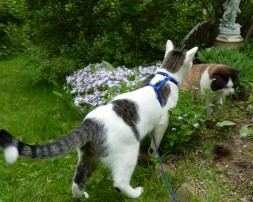 Gardens are an outdoor cat’s summer playroom. I grow catnip in my herb garden and like many cats, my cats love eating and regurgitating grass but we garden organically and never spray any pesticides. To be on the safer side, note the ASPCA list of plants toxic to cats. Summer allergies can crop up for cats. The most common one is Aspergillus mold from dust, pollen and grass clippings. Feline acne or dermatitis can occur from eating or drinking out of plastic bowls. Stainless steel or ceramic bowls are a healthier choice. Smell the roses and savor a happy summer. What’s exciting for humans can be a nightmare for cats. Loud noise from a live band, cranked up volume on a stereo, thunderstorms or fireworks are no cause for celebration for cats. Remember cats have a far superior sense of hearing and senior cats are especially sensitive. July 1st in Canada and July the 4th in the U.S. are the big fireworks days but remain popular throughout the season. The American Humane Association (AHA) reports that July 5 is the busiest day of the year for animal shelters. During noisy times this summer, provide cozy spots for kitty to hide and turn down the volume. Extra skittish cats can be calmed by Thundershirts, or a thin towel sprayed with Feliway and tightly wrapped around a cat burrito-style. Flower essences like Rescue Remedy offer gentle relief. 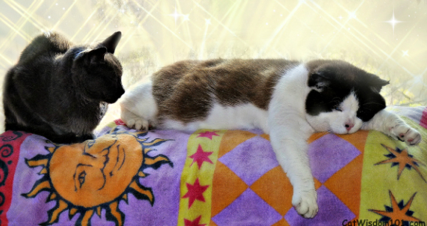 With a little commonsense and mindfulness, our cats can enjoy summer as much as we do. It’s a There’s nothing like a purring cat to help us slow down to smell the roses and savor a happy summer.